Irama Warisan Kita @ Dewan Filharmonik Petronas – footsteps……..
Orchestra Fans and music lovers will be treated to another world class performance in Kuala Lumpur and the venue is non other than the Dewan Filharmonik PETRONAS at KLCC. 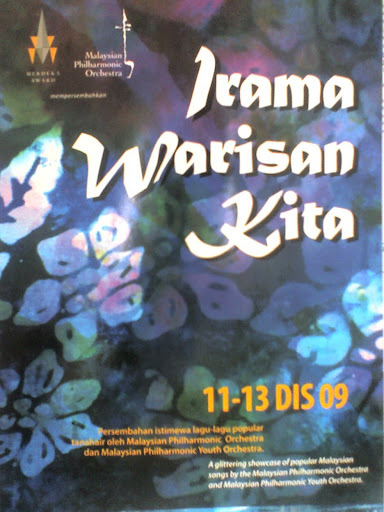 The performance presented by Merdeka Award and Malaysian Philharmonic Orchestra tittled Irama Warisan Kita will be presented from 11 – 13 December 2009. Tickets are priced at RM110 , RM 90, RM60, RM40 for Friday and Saturday while on Sunday at RM95, RM55 and RM25. The first ever on-stage collaboration between the Malaysian Philharmonic Orchestra and Malaysian Philharmonic Youth Orchestra delves into the rich treasure-trove of popular Malaysian songs. Under the baton of Dato’ Johari Salleh, and vocals by Aishah and Lah Ahmad, hear well-known songs like Bahtera Merdeka, Getaran Jiwa, Hijau and Cindai in a glittering showcase of the country’s musical heritage. Hosted by Awal Ashaari and Deborah Henry , don’t miss this extraordinary performance,onlyat Dewan Filharmonik PETRONAS.